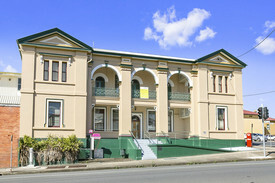 4 Commercial Real Estate & Properties in Gympie are listed in 2 categories. We have 3 OfficesLease and 1 Industrial Warehouses Lease . Located on Channon Street, with dual street frontage and disability access, this private office space would suit office or medical / allied health uses. It is the only vacancy in this complex and comes with fit out, ready for you to move your business into the space. + 91sq m (approx) tenancy + Four offices, reception area, kitchenette, staff room + Air conditioned and carpeting + Disability access + Four allocated parking spaces + Customer parking at front and rear of premises Call or email Louisa Blennerhassett to inspect the property or find out about other suitable options. Our team is strategically located in two offices across the Sunshine Coast region and is ready to handle your commercial, industrial and retail property needs today so call or email now. Position your business in this prominent CBD location. This quality industrial unit has been recently renovated, including external cladding, landscaping and new floors. This size and style of shed is unique within the Gympie CBD and well worth a look. + 104sq m industrial unit with 3.6 metre high ceilings (approx) + High exposure location + 500 metres (approx) from the Bruce Highway + Roller door access with two glass entry doors + Kitchenette + Part of a small three unit development + Recently renovated, shared amenities block + Large 5 metre high (approx) building signage under construction allowing tenant to have prominent signage to the street Call or email Louisa Blennerhassett to inspect the property or find out about other suitable options. Our team is strategically located in two offices across the Sunshine Coast region and is ready to handle your commercial, industrial and retail property needs today so call or email now.